(CNN) -- At least 12 airplanes shared the trans-Atlantic sky with doomed Air France Flight 447, but none reported any problems, deepening the mystery surrounding the cause of the plane's disappearance. 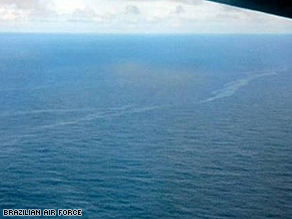 Image released by the Brazilian Air Force shows oil slicks in the water near a debris site. Airlines confirmed that at least a dozen aircraft departed roughly at the same time and traversed approximately the same route, but did not report problematic weather conditions. This has led some aviation experts to suggest that technical problems on the airplane might be the main cause of the crash, though they may have combined with weather conditions to create serious problems. The new information raises more questions than answers about Air France 447, believed to have plunged into the Atlantic Ocean somewhere between the coasts of Brazil and West Africa on May 31, presumably killing all 228 aboard. The plane's computer system reported a series of technical problems about four hours after takeoff and immediately after entering a large storm system a few hundred miles from the far eastern coast of Brazil. Severe winds, updrafts and even lightning have been mentioned as possible causes of the crash, potentially triggering a failure of the plane's technical systems. But aviation experts cautioned that weather alone would not normally cause a crash. Planes routinely fly through large storms, using the sensitive radar on board to navigate through specific storm cells. When conditions are severe enough, planes can easily deviate around or above storms, experts say. In addition to Flight 447, Air France had four other Paris-bound flights that left in the same broad time frame from that part of the world, according to an airline spokesman. One flight left Rio de Janeiro, Brazil, at 4:20 p.m. At that same moment, another Air France flight left nearby Sao Paulo. A third Air France flight left Buenos Aires, Argentina, at 5:50 p.m., also heading for Paris. A final Air France flight left Sao Paulo at 7:10 p.m., almost exactly when the doomed flight took off from Rio. All of these flights took a similar route toward Paris, heading first toward Recife on the east coast of Brazil and then continuing northeast over the Atlantic. None of the other flights experienced anything unusual, the spokesman said. All arrived in Paris the next day, with no significant delays of any kind. That same evening two Air Iberia flights bound for Madrid, Spain, left Brazil at about the same time as Flight 447; one departed from Rio de Janeiro and another from Sao Paulo, according to officials at Iberia. Those flights also reported no problems. It was the same story for one British Airways flight and three Air TAM Brazil flights, all of which flew routes similar to the missing plane. Although none of the other flights are known to have reported weather problems en route, aviation experts said weather can change suddenly and vary over short distances, so one plane might experience conditions far worse than another.